Richard Burton’s Marcellus Gallio is a tribune in the Roman army and we meet him as he hangs out in a town marketplace. He peruses the slaves, fights with his girlfriend, and meets up with a gal from his youth. Since she is played by Jean Simmons (The Big Country and Elmer Gantry) his fight with the girlfriend understandably doesn’t seem as important as it once did. If I thought for one second that anyone from my childhood ended up looking like Jean Simmons instead of Gene Simmons, I’d probably be booking my hotel room for my high school reunion now instead of planning on egging my English teacher’s car that night. Marcellus also ends up purchasing the very lippy slave Demetrius on this little excursion, but only after getting hosed out of some twins by Caligula. Caligula being the superfreak that he is, also wanted Demetrius and was a bit torqued that Marcellus bought him and the next thing we know Caligula is sending Marcellus out to Palestine on “special assignment.” I don’t pretend to know a heck of a lot about the ancient world or its hot-spots, but from the reaction of Marcellus’ dad, I can only assume that it’s a bit like being told you’re being transferred to Arkansas or going to a Cuba Gooding, Jr. movie. Marcellus maintains that British stiff upper lip that ancient Romans were famous for, takes a swig of his favorite brew and tells Demetrius to gas up his Chevy chariot and heads off to the docks so that he can sail away to his new post. Once he arrives, he gets his first job there and it turns out to be supervising an execution of three guys who are about to crucified. You get your classic dialogue at here where one of the guys asks Marcellus if it’s first crucifixion and then gives him some pointers on pounding the nails into the flesh. While Marcellus is busy trying to do his job, his ungrateful slave is out and about getting turned into a Christian and is quite peeved that his boss is going to execute his messiah. If you’re at all familiar with Good Friday then you probably won’t be in a whole lot of suspense as to the fate of Jesus, but after the dirty deed is done, Marcellus and the boys are gambling and this is when he “wins” the haunted robe. Marcellus demands that Demetrius give it to him so that he can cover up when it’s raining and this is when the robe starts laying the holy smackdown on him. He ends up going to back to Rome without it, leaving it with Demetrius who apparently has decided to just stay on in the Holy Land and hang out with his new Christian buddies. Back in Rome, Marcellus exhibits the classic symptoms of post traumatic stress disorder (he constantly screams out “were you there?” whenever someone mentions the robe) and he and the emperor decide that he should go back and get the robe so that the curse can be lifted from him. Marcellus hangs out with these people and sees that they are generous and at peace and don’t mind being all crippled up and thinks that this is a lot better than drawing crappy assignments for buying up some tan hunk that Caligula wanted and starts to see the light. Caligula becomes emperor and sends some troops out to punk Marcellus and retrieve the robe for himself since it supposedly grants eternal life. Marcellus fights off the Romans and becomes one of the flock. Bible epics are really just the uppity cousins of gladiator movies so it shouldn’t come as any surprise that the climax of the movie involves Marcellus breaking into a palace and rescuing Demetrius from being tortured to death. Somewhere along the way Marcellus finds time to fall in love with Jean Simmons and she isn’t really sold on his new found faith, especially once he gets sentenced to death by Caligula. Suddenly though she has a change of heart and calls out Caligula for being a crappy guy and decides that she wants to be with Marcellus forever and that the way to do that is to turn Christian right before their executions. This leads us to the remarkably silly ending when they walk out of the palace together and into the clouds, these crazy-brave expressions on their face while really God-like music is playing. The Robe has pretty decent sets and the costumes don’t look too chintzy (though one hopes that Burton at least had his dry cleaned before he wore the exact same one years later in Cleopatra). Burton and Simmons (who doesn’t get nearly enough screen time) add some class to the proceedings, but Victor Mature and Jay Robinson, who played Caligula, seem like they’d be more at home in a movie where the hero was named Maciste or Goliath. As to the story, it was clearly half-assed what with everyone’s quick and unexplained conversions to the new faith and dialogue that had you flinching on a fairly regular basis. To fully appreciate this movie in spite of its many shortcomings, I recommend watching the sequel, Demetrius And The Gladiators immediately following it. 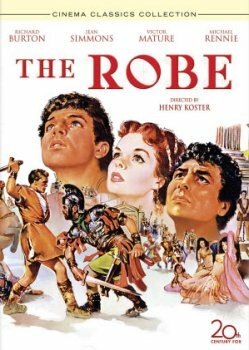 Imagine the worst aspects of The Robe taking center stage and then throw in Ernest Borgnine.